Juan Ponce de Leon may have established the oldest city in America, but oil-railroad baron Henry Flagler built it, and then some. The names of America’s early industrial tycoons come easily to people’s minds: Rockefeller, Vanderbilt, Ford, Carnegie, Morgan, to cite a few. Mention Flagler and most people say who? 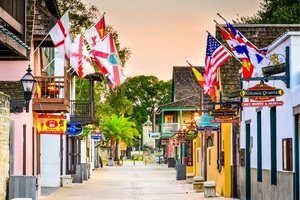 But ask a Floridian and they’ll tell you about a city, a county, a beach, a college, museums, hospitals, buildings and over one hundred streets, parkways and boulevards from St. Augustine to Key West. When Henry Flagler decided he liked Florida, he went all in. In the late 1800s Flagler teamed up with John D. Rockefeller to form Standard Oil, and Henry’s fortune flowed like the gas and oil he sold. Shivering in his New York home (despite free heat), Henry was ready for a warmer climate and new adventures. A honeymoon in St. Augustine became the start of his love affair with Florida. The result? The still operational Florida East Coast Railway―train service that ran the length of the state, with viaducts spanning the waters all the way to Key West. Along the route, hotels, businesses and communities sprang up. His adventurous spirit left a trail throughout Florida, but his most enduring mark was left in St. Augustine where he first fell in love. 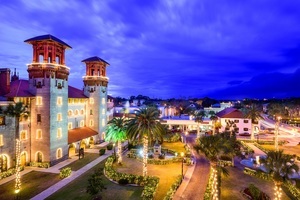 Flagler in 1888 opened his first public accommodations, the grand Ponce de Leon Hotel, a magnificent display of Spanish Renaissance Revival architecture. With electricity by Thomas Edison―one of the first hotels in the country to have it―and stained-glass windows by Louis Comfort Tiffany, Flagler’s hotel branded St. Augustine with a unique guise that is its face to this day. The former Ponce de Leon Hotel, now housing Flagler College, draws the eye of approaching travelers from across the Bridge of Lions, with its high towers and multiple balconies. Across the street, the former Hotel Alcazar, also built by Flagler, reveals more of his panache, matching the de Leon’s superb architecture. It now houses the Lightner Museum. Tours of both buildings reveal incredible detail in both architecture and ingenuity. 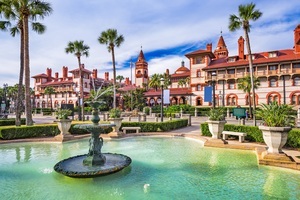 Outside the former Ponce de Leon Hotel, terra-cotta tile and coquina concrete rise up and around, encircling visitors like a warm embrace as they ponder a colorful and deceptive fountain in the garden entryway. Inside, Flagler College students take lunch in a dining room shaped to enhance acoustics, where small orchestras once kept hotel guests entertained. The rotunda walls boast priceless Tiffany stained glass, arcing like kaleidoscopes around the room. A soaring front lobby dome supported by hand-carved pillars reveals costly gold-leaf sculpture and symbolic paintings. In the palmed and manicured interior courtyard of the Hotel Alcazar, giant koi, viewed from an arched stone bridge, wander aimlessly through a small pond. Three sprawling floors inside offer paintings, blown and stained glass, a unique collection of pianos, sculpture and more, in a hotel that once boasted of having the world’s largest indoor pool, which is now a restaurant. Charming shops line St. Augustine streets and pedestrian-friendly walkways. And St. Augustine hasn’t forgotten Henry Flagler. The early debut of electricity he brought to his hotels is wildly embraced by the city, with beads of lights trimming the spires and rooflines of these unique buildings. Nights of Lights starting in November is an all-out effort to multiply the effect by lighting the town and its structures in every possible way. Strings of lights wrap the trunks of old palms and drape from tree top to tree top. Horse carriages and multi-car trams twinkle as they snake through the narrow streets, bathing their riders in the glow of up-lighted structures and spotlighted facades. Shops and restaurants create magical backyard fantasies of luminescence. Even the river sparkles in reflection of the city’s efforts. Henry Flagler in 1913 died in Palm Beach. He was eighty-three. The man called the Father of Miami was brought back to his beloved St. Augustine by train, with mourners peppered along the route to pay their respects, appropriately so. Florida owes a great debt to Henry Flagler, one he would have no interest in collecting. He came to a place of wilderness and wetlands and left it greatly enhanced. The money and effort he brought to enrich the Sunshine State was always a heartfelt effort on his part as much as an investment in commerce. One could say the magical city of St. Augustine is his special gift to Florida. Written by Thomas O’Grady Jr., an author and freelance writer living in Palm Coast, Florida.